The loss of near vision can develop at any age, but it often hits people in their mid-forties. You call your teenager out of her cocoon in her room to read a medicine bottle for you. You tell the waiter, “I’ll have what she’s having,” because you can’t read the fine print on the menu, and you don’t know what to order. Your friend of the same age shows you how you can increase the size of your font on your phone. You look like you’re playing the trombone as you try to find that sweet spot where you can read an instruction manual. You’re getting older, and as that happens, special things begin to happen to your body. One of those special things is that you have a difficult time seeing. Presbyopia is the fancy medical term to describe such a condition. We all know that our vision changes as we get older, but most women in their mid-forties are not ready to purchase glasses like their grandmas wore. You know – the ones that dangled from a chain around her neck when she didn’t need them? 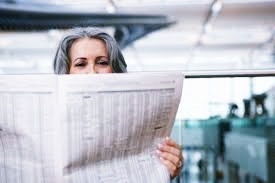 We know that once we need reading glasses, it is only a matter of time before other signs of aging occur. How long will it be before you start wearing knee-high hose with dresses? Should you check the mirror to see if you are wearing two matching earrings? Did you just tell your husband the same story that you told him an hour ago? Fortunately for you, we live in a miraculous age where people go to work in labs every day to figure out how you can see better “at your age.” These scientists have developed contact lenses and, more specifically, the use of monovision contact lenses. Unfortunately, the scientists who were in charge of naming this type of vision correction system may have been more “science” types than “word” types. The Greek root mono, meaning “single” or “alone,” does not accurately describe what is going on with your vision when you use both of your eyes to see, but those scientists can’t be good at everything. Monovision contact lenses work this way. 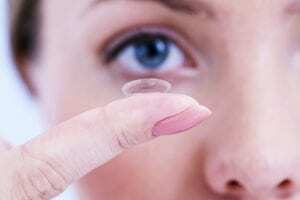 Your optometrist prescribes a contact lens for one eye that corrects your distance vision. Your distance-vision eye is usually worn on your dominant eye. The other eye is fitted with a contact that corrects your near vision. As crazy as it sounds, lots of people are walking around right now with contacts just like this, and chances are they are all in their forties or older. There are a couple of different versions of monovision. The type that is best for you depends on how you respond to the contacts and how you spend most of your time. Mini-monovision is great for people who drive a lot during the day but spend little time on a computer or reading. Good candidates for mini-monovision are people who don’t mind wearing reading glasses every once in a while, because you will be only slightly corrected for near vision. Modified monovision is another interesting option. In modified monovision, a single vision contact lens is worn on the distance eye, and a bifocal contact lens is worn on the near eye. The benefit of this system is that the distance vision is slightly sharper than with the mini-monovision correction. Is a monovision system for you? Perhaps, but there are some compromises you have to make when it comes to sharpness of your sight. If you are a type-A personality and cannot tolerate a distance that is slightly fuzzy, monovision contacts may not be the right ones for you. If you find that you still need your reading glasses, and you use them all the time, monovision contacts may not be for you. After all, if you have to carry around your reading glasses all the time anyway, why would you sacrifice having a sharp distance vision? Another thing to consider is that individuals using monovision contacts may suffer from a decrease in depth perception. This decrease in depth perception can be annoying for those who enjoy sports, but it could also feel unsafe if it causes you to miss a step. If this could cause you to be unsafe or if you are a golfer or play tennis, you may consider choosing a different type of contact lens system. Related: How Much Do Contacts Cost? Some monovision contact lens wearers report that they have a more difficult time driving at dusk and night with their lenses. Because of this, some doctors recommend that you only wear glasses while driving at night. If you would rather not switch from contacts to glasses to drive at night, monovision contacts might not be the best thing for you. Do these issues with monovision cause you concern? There is another option. Your doctor may recommend that you try multifocal corrective lenses. Multifocal corrective lenses are the new technology that is considered an upgrade over traditional monovision contacts. In fact, your doctor may not even recommend monovision contacts to you at all since multifocal lenses are the new standard of care. Multifocal lenses provide better vision at close-range, mid-distance, and far away. Like the monovision lenses, you may not have super-crisp vision at a distance, but studies have shown that it is better than if you were to use monovision lenses. In fact, studies have shown that seven out of 10 patients prefer multifocal lenses to the monovision ones. Simultaneous vision multifocal lenses are designed so that the wearer looks through a specific region of the lens to provide the sharpest vision for the situation. The two types of simultaneous vision systems are concentric and aspheric. The next type of multifocal lens is the segmented design. These lenses are designed like bifocals and trifocals. Some of these lenses have the distance power portion of the contact in the center of the lens. Some have the near power in the center of the contact. Others have the distance area centered on your dominant eye, and the near prescription centered in your non-dominant eye. Compared with monovision contacts, multifocal lenses provide a little better depth perception. They hopefully will enable you to put aside your reading glasses for most daily operations. The disadvantage of the multifocal lens is that you will not have super sharp or crisp vision. If you are in your forties and wish to wear contact lenses, you will need to be patient. There is no one-size-fits-all solution to your vision correction at this stage of the game. It takes time and skill for a doctor to determine which type of lens will work best for you. After a lens is chosen, it will take time for your brain to adjust to having to see differently than before. The length of time it takes to adjust varies from person to person. First, your doctor will assess how you use your eyes during the day. Your doctor will ask what you do for a living, or if you have any hobbies that take up a lot of your time. Perhaps you spend a lot of time in front of a computer and need good intermediate vision. Maybe you are a nurse and need to have good close-up vision to look at charts, but you also need to be able to read monitors that are over five feet away. Perhaps you are a plumber and are often working in tight spaces, during which time you need to be able to see details of your work. Maybe you are a truck driver, and you need to be able to see well while driving at night. Depending on the situation, your doctor may recommend that you get contacts that are suited for distance vision. This may be the right choice if you are a driver and spend little time with detailed, close vision. However, keep in mind that if you go this route, you will probably need to use readers every time you want to see something up close. If this does not describe you, and you would prefer never to wear readers or glasses of any type, the doctor will continue the exam. The next step during your eye exam is a refraction or vision test. Your doctor will spend time trying to get the most accurate prescription possible for your eyes. If you have 20/20 vision, this means you will be able to read letters that are 3/8 of an inch tall from 20 feet away. If you do not have 20/20 vision, you may have astigmatism, which is a refractive problem with the eye that is caused by a stretched-out lens. Astigmatism causes blurry vision. If your vision is not perfect, you also may have hyperopia, which is also known as farsightedness. This means that you can’t see things that are close to you. You may also have myopia, which is also known as nearsightedness. This means you struggle to see things that are far from you. If you are in your forties, chances are you also have presbyopia. This condition is when you lose the ability to focus quickly on objects that are close at hand. If your doctor thinks that your lifestyle and your refraction test calls for monovision or multifocal lenses, the rest of your appointment time will be spent narrowing down your choices to find one to try. At this point, your doctor may try to determine which is your dominant eye. To do this, your doctor may have you extend your arms out in front of you and create a triangle between your thumbs and fingers at a 45-degree angle. He or she will then have your center the triangular opening on a distant object. As you look through the object through the triangle, you will be asked to close your left eye. If the object is still centered, your right eye is your dominant eye. If the object is no longer in your frame, your left eye is your dominant eye. Choosing the right lens is part art and part science. Your doctor will use his or her professional judgment to recommend the right type of contacts for your situation. 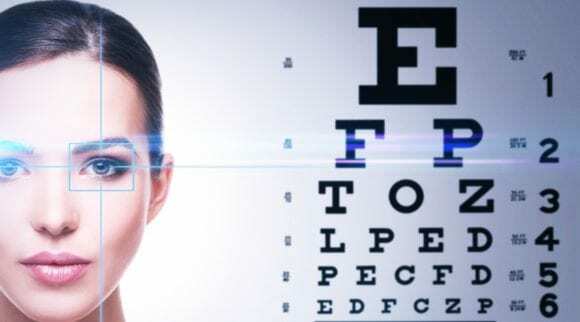 As you try out your new contacts in the doctor’s office, hopefully, he or she will explain that multifocal and monovision contacts should help you see well for about 90-95 percent of your normal activities. If your doctor tells you that your new monovision contacts will leave you with perfect vision, he or she is telling you a lie. This may sound harsh, but these types of contacts will not give you perfect vision. Your doctor will more than likely start with as simple of a solution as possible. Chances are, he or she will have you try on a pair of contacts as you sit in his or her office. More than likely, the contacts will feel strange. You may see shadows or 3D images up close. Your distance vision may seem fuzzy. 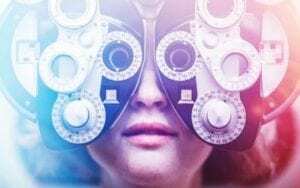 You may feel anxiety as your doctor says to “try these lenses for a week” because you may feel that you are never going to get used to such an odd way of viewing the world. Listen to your doctor. He or she is the professional, and they have seen others go through this process before you. Wear your monovision contacts home. Put the new contacts on the next several days, even if you dread doing so. Do your normal daily activities. Hopefully, the negative symptoms will go away as the week progresses. Throughout the week, pay attention to your vision. Are you able to see things at a distance? Are you able to read road signs while driving? How is your vision while driving at night? Are you able to use the computer normally? Do your eyes feel more tired at the end of the day spent staring at a screen? Are you able to see things close-up without reaching for your reading glasses? If you do need your reading glasses, is it for extremely detailed work? How often do you do work such as this? How do the contacts feel? Are your eyes itchy or red? Do you feel like you have an irritant in your lens? Are you blinking more? Do your eyes feel dry? Are the contacts easy to manage? Do they roll up as you try to put them in your eye? Do they suction to your eye easily or do they often feel as if they are on the verge of coming out of your eye? After a week, your doctor will have you return to his or her office to discuss how your week with your new contacts went. This is the time to be truthful with your doctor. After a week, your eyes should have almost adjusted to this new type of lens. If your vision is suffering, and you feel that you cannot see well 20 or 30 percent of the time, the doctor may adjust your prescription. If your eyes feel irritated, your doctor may put you in a different brand of lenses. If your doctor changes the prescription or lens type, he or she will more than likely have you try the contacts out for another week before returning to the office. This process may need to be repeated several times until you and your doctor feel as if you have the right contacts for your situation and lifestyle. 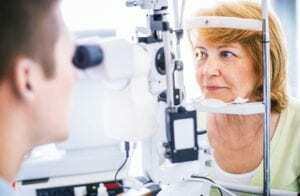 While keeping in mind that your eyesight will never be totally perfect in these types of lenses, if you are not happy with the contacts for any reason, you need to tell your doctor. Their job is to make you happy. 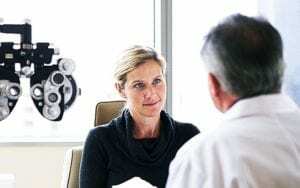 If your doctor becomes irritated with you because you have a difficult time getting fitted with a pair of contacts, you need to seek out a different doctor. Sometimes the contact lens manufacturers will offer rebates for purchasing their products, and the rebate amounts are often determined by how many contacts you purchase. If you are new to multifocal contacts, you may want to avoid buying a yearly supply at once, even if the rebate percentage is better for such a purchase. Even though you may feel satisfied with your contacts at the moment, you may change your mind. Multifocal contacts are expensive, and you don’t want to feel as if you have to stay in a prescription or a type of lens for a year if they don’t suit your situation. If you purchased a year’s supply, you would be more than likely not to switch mid-year. This is especially true if you have never worn contacts before ordering your multifocals. You may have a friend or family member who struggled with eye health after wearing contacts. If you have never worn contacts, you may have questions about how to keep your eyes healthy while wearing them. Here are some general guidelines on how to keep your eyes healthy and happy while wearing contacts. Wash, rinse, and dry your hands before touching your contacts or your eyes. 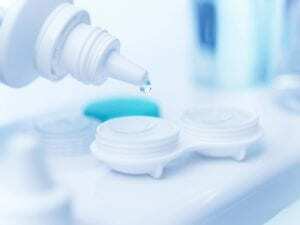 Do not use lotions, perfumes, or apply makeup before putting in your contacts. Make sure your fingertips are free of lint or any other debris before touching your contact. Only use your fingertips to handle your contact lens. Do not use your fingernails or tweezers. Look at your contact before putting it on your eye. Make sure it is not inside out before trying to insert it. Make sure it is free from debris. Never insert your contact if there is any type of debris on the lens. Wash the contact with the appropriate saline solution to get the debris off before insertion. If your doctor has prescribed daily disposable lenses, make sure you wear your lens for one day only. Do not stretch out your wear to try to save money. If you want to continue being able to wear contacts, you need to treat your eyes well. Daily disposable lenses were designed by scientists to be used for one day and then disposed of in the trash. Do not use your saliva or tap water to rinse your contacts. Your mouth is full of germs; don’t spread those germs to your eyes. Instead, clean your contacts with fresh solution that has not expired. Make sure the solution is capped immediately after each use. If it is not capped, the solution could be contaminated. 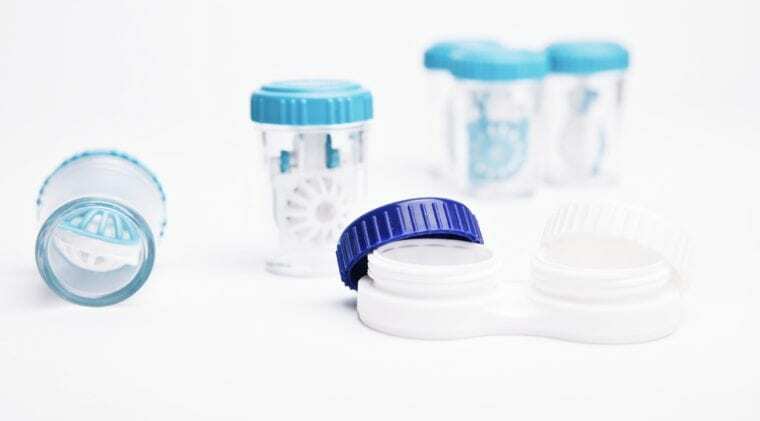 If you do not have disposable lenses, take them out each night and store them in new saline solution. Refill your lens case each night with clean solution. Never share your contact lens case with others. Sometimes your doctor may prescribe extended-wear lenses. Follow the manufacturer’s recommendations on how to wear these lenses. At most, manufacturers allow contacts to be worn for a week at a time without removing them. Do not extend this time. Insert your lenses before you apply your makeup in the morning. Remove your lenses before washing off your makeup at night. 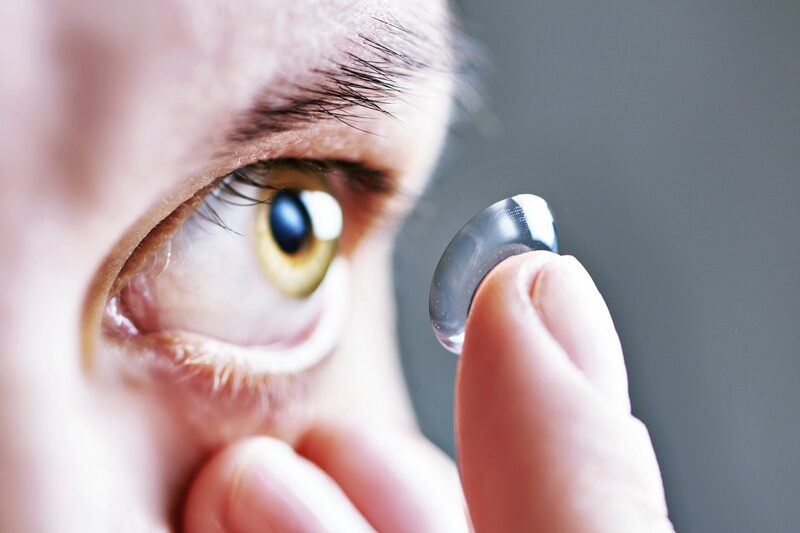 If you have never worn contacts, you may be nervous about the idea of inserting them into your eye and removing the contacts at the end of the day. This can be a nerve-wracking thing for people to attempt, especially if they are squeamish about touching their eyes. Just like most things, putting in and taking out contacts requires practice. Your eye care professional will have someone in the office who will help you insert and take out your contacts. This is usually not your eye doctor. When you call to make your appointment, make sure the scheduler knows that you are a first-time contact lens wearer. The scheduler may ask you to allow another hour of time for your appointment so you can practice inserting your contacts. The office worker helping you with this process will not let you go home without being able to put in and take out your lenses. 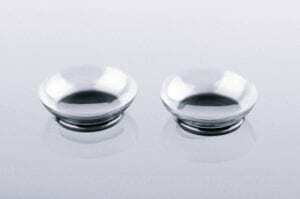 If you have never worn contacts, you may have a lot of questions regarding the problems associated with wearing them. Most of the time, after practice, you should be able to put in your contacts with ease and wear them without remembering they are in your eyes. There are times when they may cause irritation or pain. A torn contact lens may cause some of the irritation. Soft contacts can tear. Fingernails are usually the cause of the tears. Do not put a torn contact in your eye. It may scratch the cornea. At other times, the irritation may be caused by your contact getting stuck under your eyelid. Do not become alarmed if this happens. Usually, you can see the contact peeking out from the eyelid, and if that is the case, you can grab the edge with your fingertips and take it out of your eye. If the contact seems to be entirely under your eyelid, gently massage the area, pushing the contact downward until you can see it. Sometimes you will struggle to put in a contact because it has flipped or become inside out during the process of putting it on your eye. If the contact becomes inside-out, it usually won’t adhere to your eye, and you will notice that something is wrong immediately. If you were able to get the contact on your eye inside-out, it will be uncomfortable. If this happens, don’t panic. Just take the contact out, rinse it with your saline solution, and put it back in the right way. Sometimes your contacts will feel uncomfortable because your eyes are dry. If this is the case, there are several fixes to make your eyes feel fresh again. First, make sure you are blinking an appropriate amount. If you spend a great deal of your time in front of screens, you may not be blinking enough to moisten and refresh your eyes. Consciously remind yourself to blink more often. You may even need to attach a note to your computer to remind yourself to blink. Also, be aware of your surroundings if you are suffering from dry eyes. If your work area is by a vent or a fan, your eyes may dry out and become irritated faster. Move your work station if the placement causes your eyes to become dry. If your eyes are dry while wearing contacts, make sure you take breaks from staring at your computer screen. Every twenty minutes, close your eyes for up to twenty seconds to give your eyes time to rest. If your eyes are so dry that you feel the need to use eye drops, make sure you use the type that are appropriate to use with contact lenses. Make sure your eye doctor knows if you suffer from dry eyes. A new type of lens may help eliminate that symptom.